Spheres were the subject of my very first Kitchen Tech column, and in celebration of today’s 11th Kitchen Tech, I’m returning to the theme again — with a twist. There are many magic tricks in the world of avant garde food and beverages, but only a few that are marquee-quality. Spherification — the science of turning liquids into delicate, caviar-like balls — is probably my favorite. If you’ve ever had salmon roe, the bright orange fish eggs popularly used in Ikura sushi, you already know the “burst in your mouth” sensation that makes gel-coated spheres amazing. Spherification was introduced to the public by Ferran Adria’s team at the Spanish avant garde restaurant el Bulli in 2003, leveraging and expanding upon an idea originally developed by food scientist William Peschardt in the 1940’s. The “basic spherification” technique places a liquid containing sodium alginate, a salt found in seaweed, into another liquid containing calcium. Sodium alginate reacts with the calcium, rapidly forming a soft gel around the liquid core. el Bulli first debuted its spheres as “ravioli,” starting with opaque savory pea and barely translucent sweet mango versions that looked like soft bonbons. The idea was to place an intact sphere in your mouth, then pop it with your tongue, such that the powerful liquid center overwhelmed your senses. 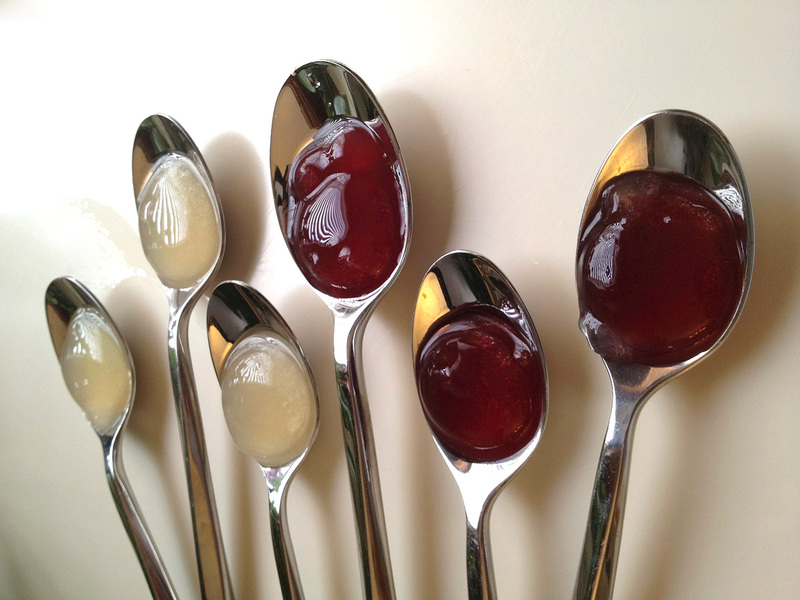 However, spheres made with the “basic spherification” technique become more solid as they sit longer, so they need to be served quickly. In the same year, el Bulli used spherification for an item that would later inspire a thousand copycats: cantaloupe melon caviar, which Adria subsequently called el Bulli’s signature dish of 2003. Roughly the size of salmon roe, the caviar were eventually offered in a wide variety of fruit, nut, oil, and other flavors, serving as a deluxe topping or addition to cocktails. 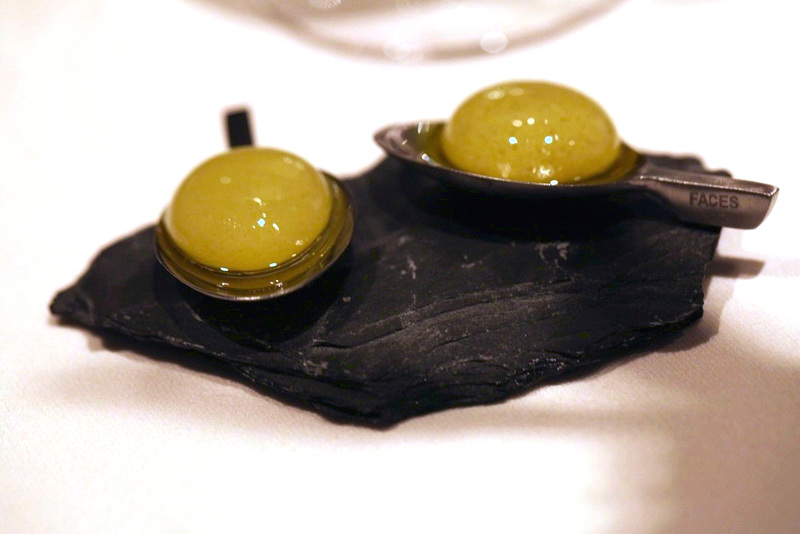 It took two years for el Bulli to develop the variation on spherification that enabled what has become one of the restaurant’s best-known dishes: liquid olives (shown above, mixed with traditional olives). Called reverse spherification (alternately “inverse spherification” or “spherification-I”), this technique places a liquid containing calcium into a bath containing sodium alginate. Unlike basic spherification, the globes created here do not continue to solidify after they’re removed from the bath and rinsed with water; they also hold their shapes better when placed on a plate. This technique also works with a variety of liquids that wouldn’t work with basic spherification, very notably including alcohol. Suddenly, cocktails could be turned into snacks, or spheres containing one spirit could be added to another. In the photo above of a Spherified Sake Bomb, the classic combination of beer with a sake shot glass inside is updated, replacing the shot glass with an edible sake sphere. 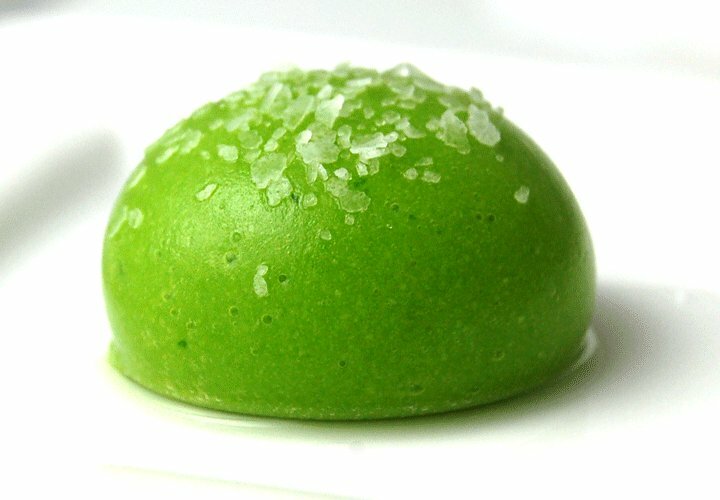 Finally, mimetic spherification (also known as “moldable spherification,” or “spherification-M”) enabled the reverse spherification technique to be applied inside molds. As discussed in the el Bulli 2005-2011 book set, handmade almonds, pistachios, alphabet letters and other shapes all became possible thanks to spherification, even if they didn’t look like spheres. 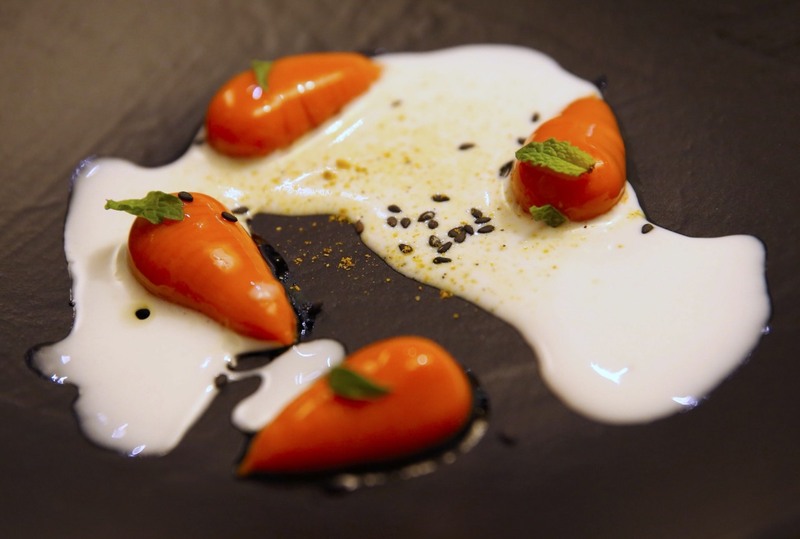 This application with mimetic carrots was a particularly fun dish to eat. 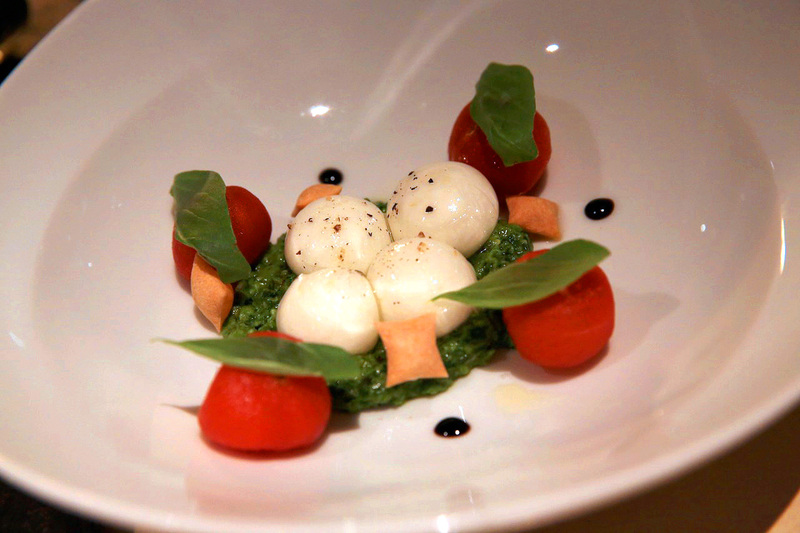 Not Your Everyday Caprese Salad. This rethought version of the Italian classic looks simple, but uses liquid mozzarella spheres in place of the solid cheese found in typical caprese salads. White Sangria in Suspension. 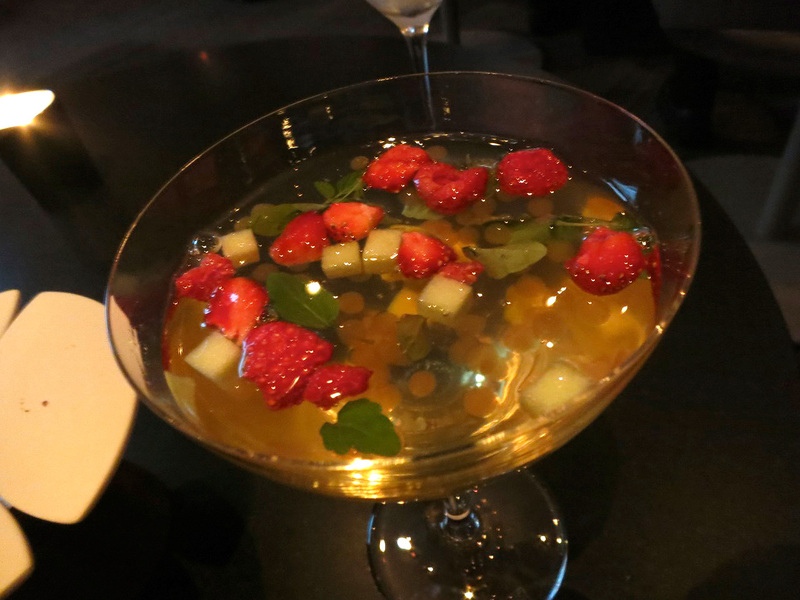 This modernist classic cocktail (video here) used a mix of melon spheres and cubed fruit to create an ever-changing mix of textures, shapes, and flavors within a martini glass. Red Wine Spheres. 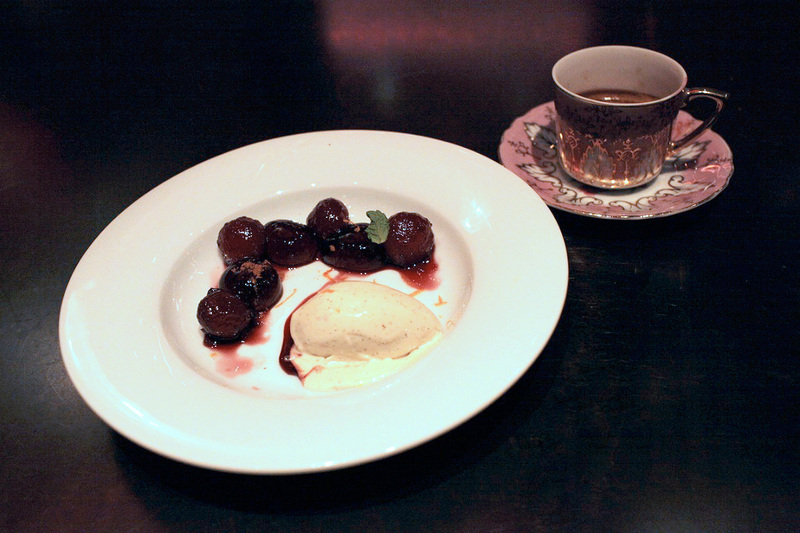 This wonderful dessert mixed red wine-soaked apple balls with red wine spheres – in a dim room, you can’t tell the difference between the spheres until they’re in your mouth. Fabes con Almejas, or Clams with Beans. 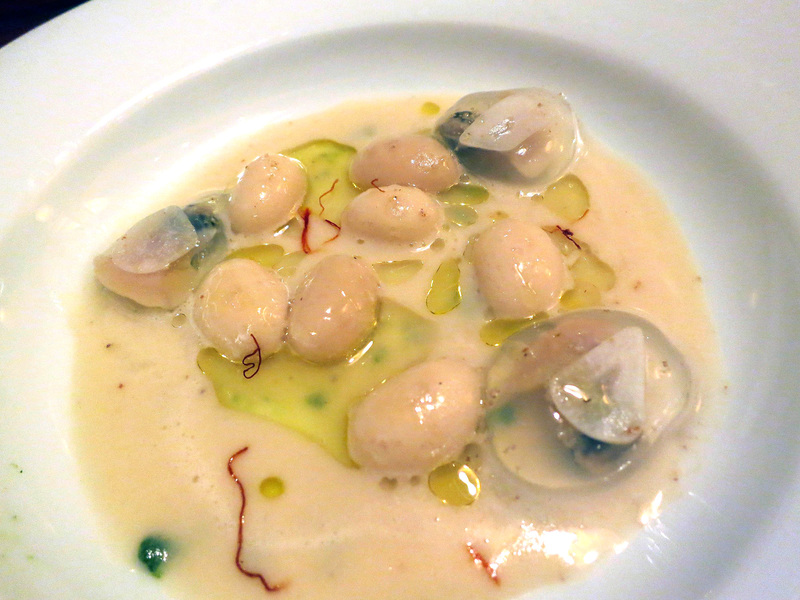 In addition to containing spherified clams, these spheres were shaped to look like beans, actually improving upon a traditional Spanish dish by removing the grainy bean texture and allowing their flavor to shine through. Spherification is a lot easier than it sounds: you typically use two types of (naturally occurring) powder, one mixed with a fruit juice, pureed vegetable, or liquid cheese, while the other is blended into water to form a bath. Using a solid spoon or food-safe syringe, you drop a measured quantity of the flavored liquid into the bath, give it a little time to sit, then pull it out with a slotted spoon and wash it off with water. That’s it. Your spheres may not be perfect on your first try (my early experiments are shown above), but you’ll quickly master the technique. The easiest way to start spherifying things at home is to begin with a basic kit, and since there are many different options out there, I’m going to simplify things by pointing you to the easiest two options you can start with. First is the Molecule-R Cuisine R-Evolution 2nd Generation Kit ($38 shipped). It includes the sodium alginate and calcium lactate you’ll need for spherification, as well as the soy lecithin needed for the salt air margarita I featured in last week’s column, and agar agar for making gelatinous spaghetti. Critically, it also includes the proper type of slotted spoon for removing spheres from the alginate bath, plus a syringe for making small spheres, a silicone sphere mold, tubes, pipettes, and 50 recipes on a DVD. I would also strongly recommend this AWS Signature Series Digital Pocket Scale ($9, normally $18). It is absolutely critical to properly measure the sodium and calcium powders needed for spherification, and you’ll need a scale with the 0.1 gram digital precision of this model; it’s the one I have, it works, and it’s cheap. If you don’t already have one, an immersion hand blender is extremely useful for blending the powders into your juice and water baths. 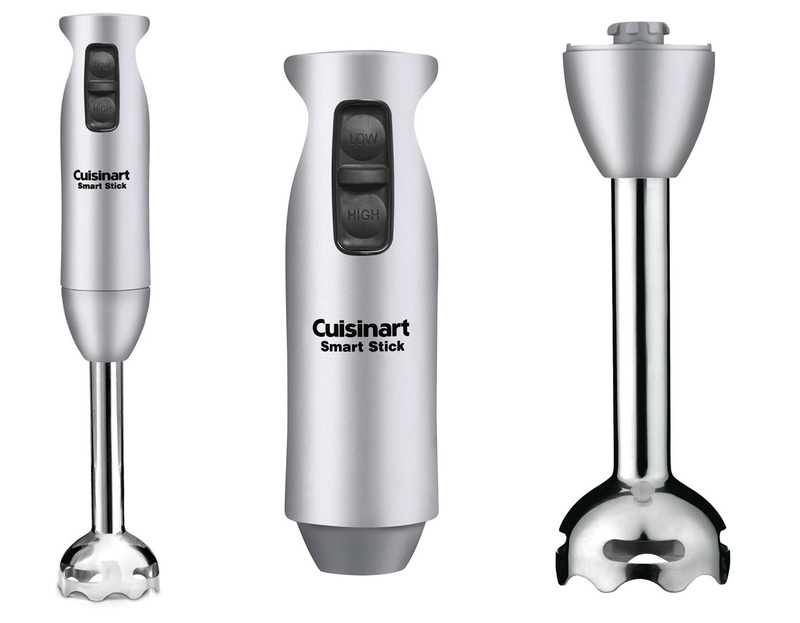 This Amazon top-rated Cuisinart Smart Stick ($35, reg. $65) was featured in last week’s Kitchen Tech column, and like the Molecule-R kit above can also be used to make salt air margaritas and other magical avant garde snacks. At some point after you’ve tried making spheres for yourself, you’ll probably want to start making big batches of flavored caviar to show your friends and family (yes, this will happen). When that day comes, check out this Rapid Molecular Caviar Maker Kit ($80), or if you want to supply the plastic syringe yourself and save a bunch of money, this Scienceware Vaccu-Pette ($44) otherwise does the same thing. I’ve used the Rapid version, and though they’re a little challenging to clean, they save an incredible amount of time when producing lots of tiny little spheres. 9to5Toys readers have told us that they’ve “thoroughly enjoyed” Kitchen Tech, praising it as “very well written” with “great” book recommendations. Here’s what I’ve covered in past weeks. 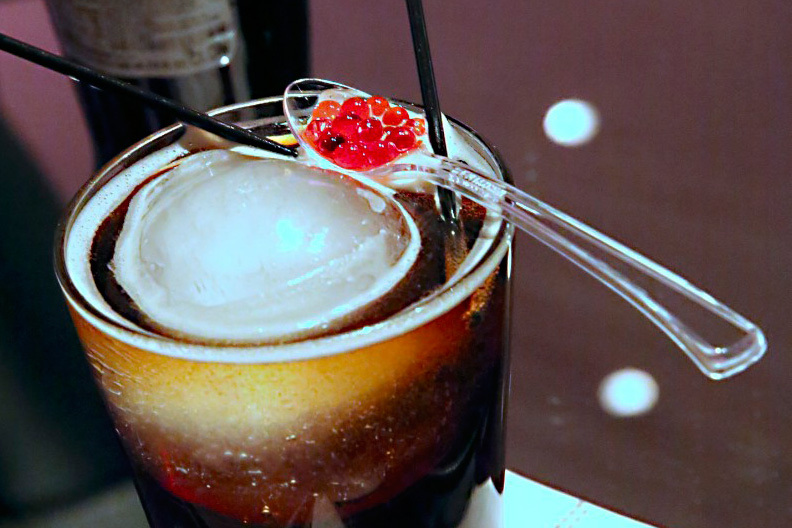 Column 1: Learn how to up your drinking game with magical ice ball makers, which transform everyday drinks into classics – recently updated with a great affordable pick! Column 2: Radically improve meats, poultry, and fish with Sous Vide water baths, which turn plain pieces of meat into succulent, restaurant-caliber steaks, ribs, and more. Column 3: Learn about avant garde cooking with incredible modernist cookbooks, which bring professional, modern recipes and techniques home. Column 4: Explore part one of the world of bar tools, starting with fundamental items needed for preparing cocktails, then continuing with “good idea” tools that will make your drinks even cooler. Column 5: Part two of the world of bar tools, including the “fancy stuff” that makes restaurant-caliber cocktails possible. Column 6: Chemex’s new Ottomatic pour-over coffee machine, Wilfa’s Precision Coffee Maker, and the world of premium coffee makers. Column 7: Explore home- and restaurant-caliber wine and champagne tools, including the Coravin wine preservation system and much more. Column 8: Create restaurant-caliber rotisserie beef, pork, and poultry with the Showtime Rotisserie Oven, one of my favorite easy-to-use home cooking tools. Column 9: Use a pressure cooker to create incredible fried chicken, sandwiches, crisped meats, soft beans, and rice in record time. Column 10: Puree fruits, vegetables, and nuts into silky smooth smoothies and soups with a Vitamix blender, and create foamy cocktails with a hand immersion blender. Author, lawyer, and award-winning restaurateur Jeremy Horwitz started his journalism career in the early 1990’s, covering video games as a freelancer before creating and running Ziff Davis’s Intelligent Gamer magazine. 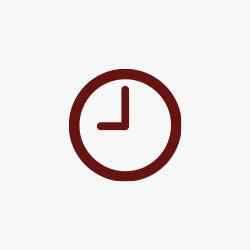 A graduate of Cornell Law School, he previously ran editorial for the Apple-centric site iLounge and created the historic iLounge Pavilion at CES before joining 9to5Mac and 9to5Toys as a Senior Editor. A lifelong consumer electronics expert and gourmet, he now focuses on the changing ways people play, eat, and travel. His Spanish restaurant and gintoneria Aro Bar de Tapas won multiple awards, including Best New Restaurant (Opened 2015-2016), Best Craft Cocktails, Best Desserts, and Best Charcuterie.